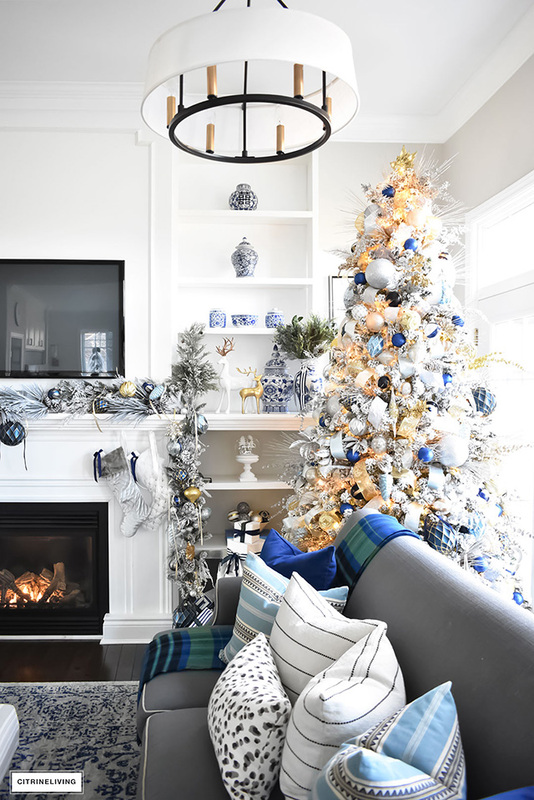 I’ve been talking about my sharing Christmas home tour with you for about two weeks now, and this year, I’ve decided to try a different approach. 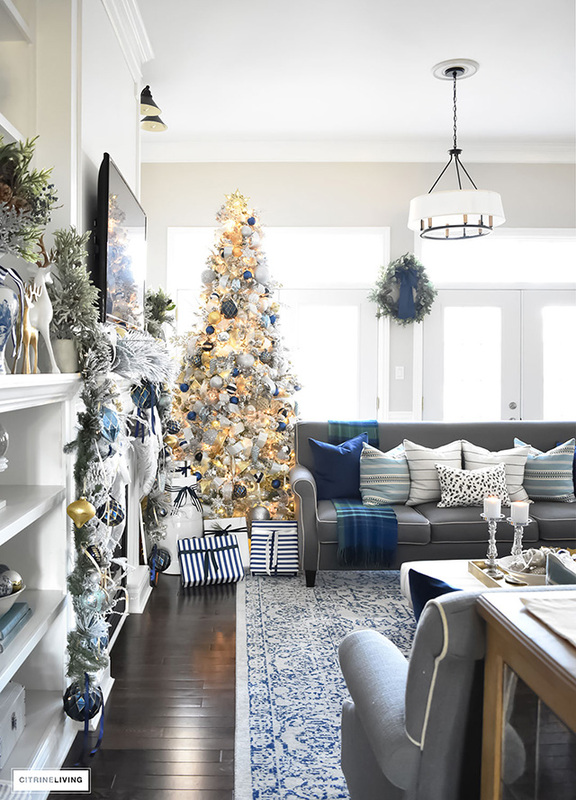 Instead of my usual seasonal home tour, where I walk you through the main living areas in our home, I’ve decided to showcase each space individually with you this Christmas. 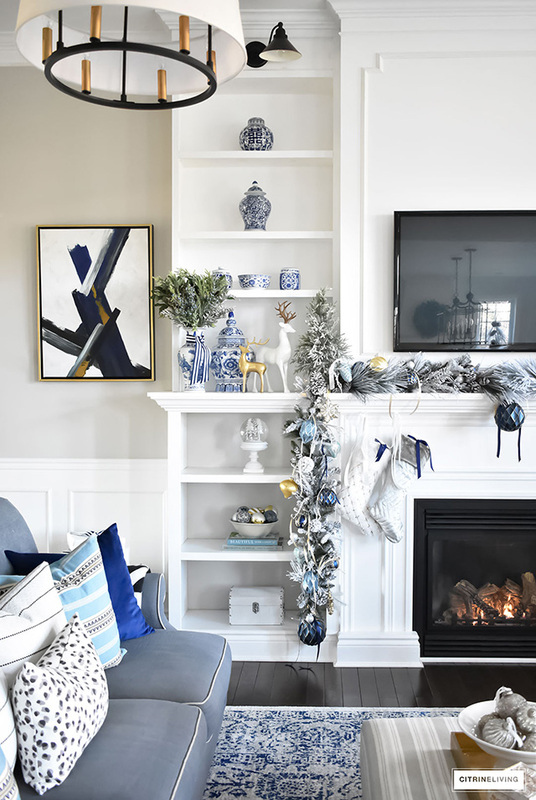 While I love to share our home in one, large comprehensive tour, I have so many pictures to share, I thought it would be fun to break it up into a series of posts this season, that way you get to see much more than you normally would! 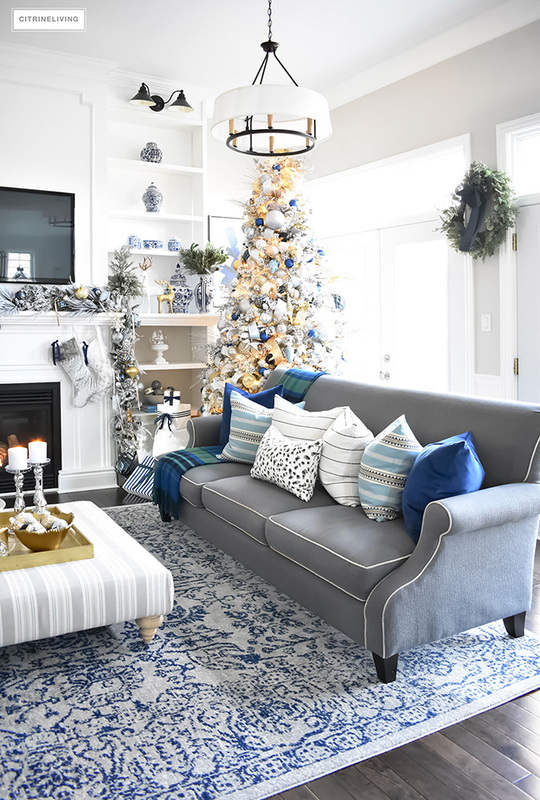 So with that, today I’m sharing our living room, decked out in all of it’s blue and white Holiday glory! 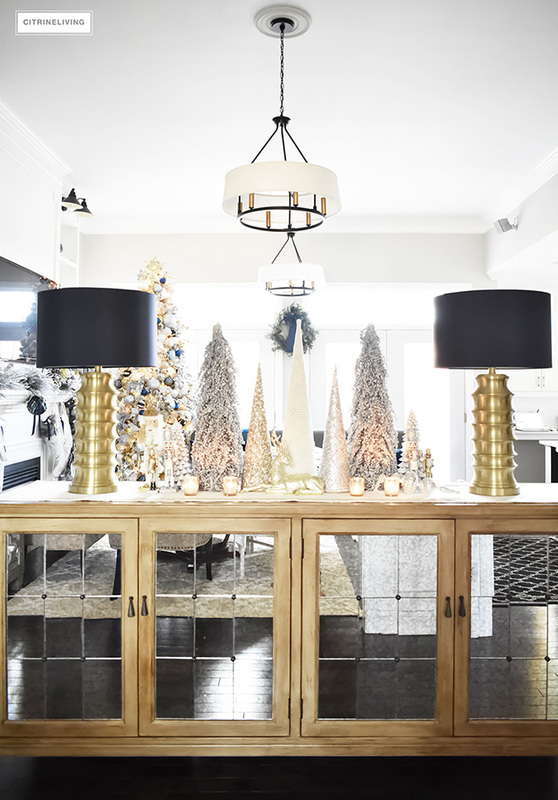 With my gold and silver holiday decor, I have to say, I’m loving the look this year. 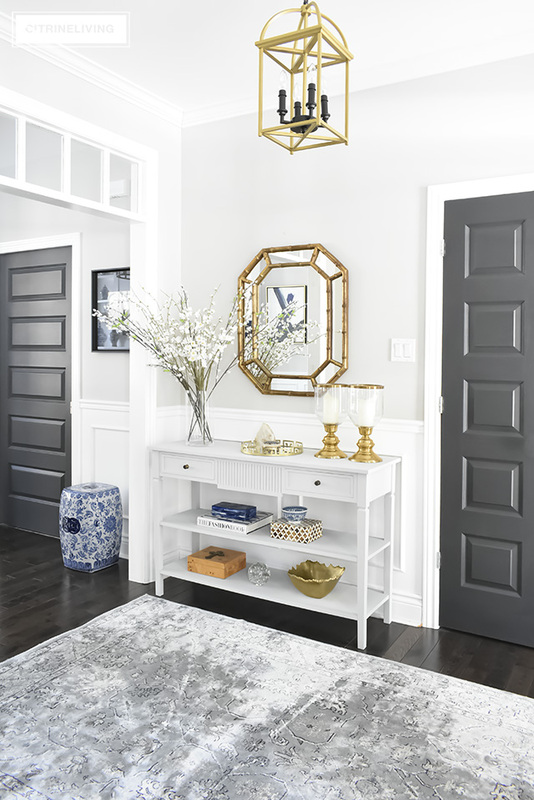 Grab a cup of coffee and relax, while I walk you through our most used room in our home. You’ll notice I have a mix of greenery happening in here. 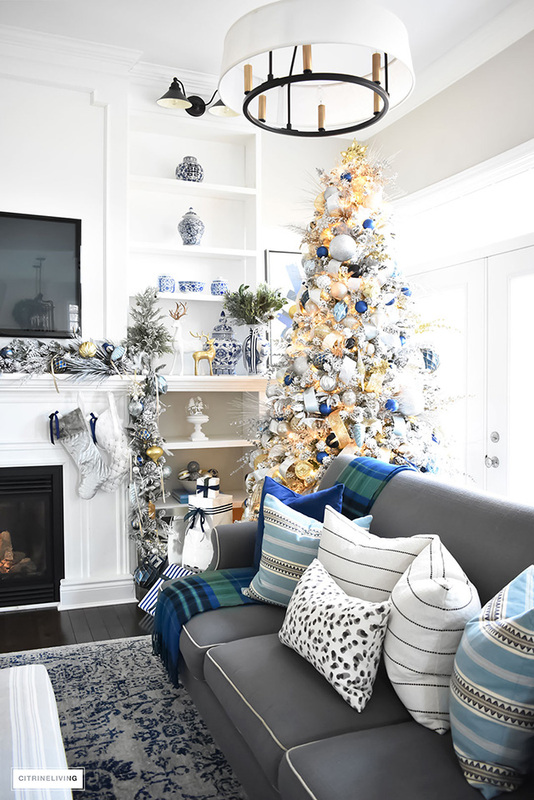 Our tree and garland are both flocked, while the wreath between the doors and the greenery in my blue and white vases is not. 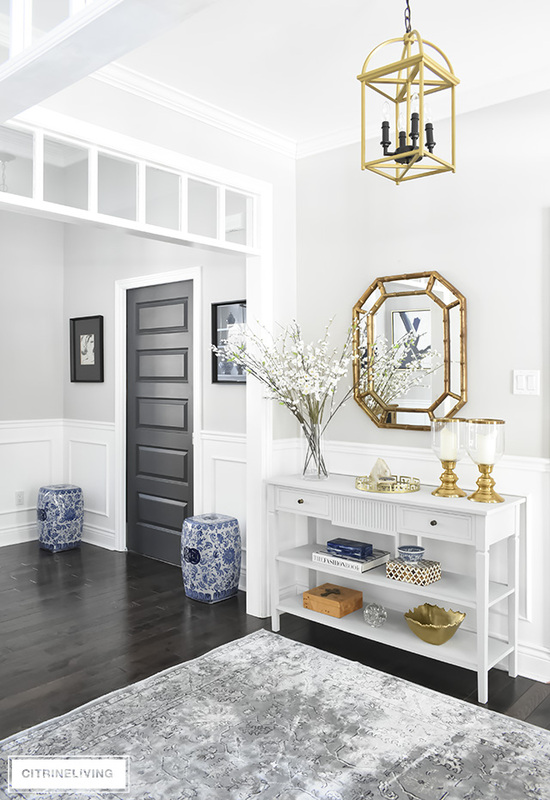 I specifically still wanted to have touches of green throughout our home this season, to try to avoid a look that’s too cold. The green brings in that natural element that I always love at Christmas. 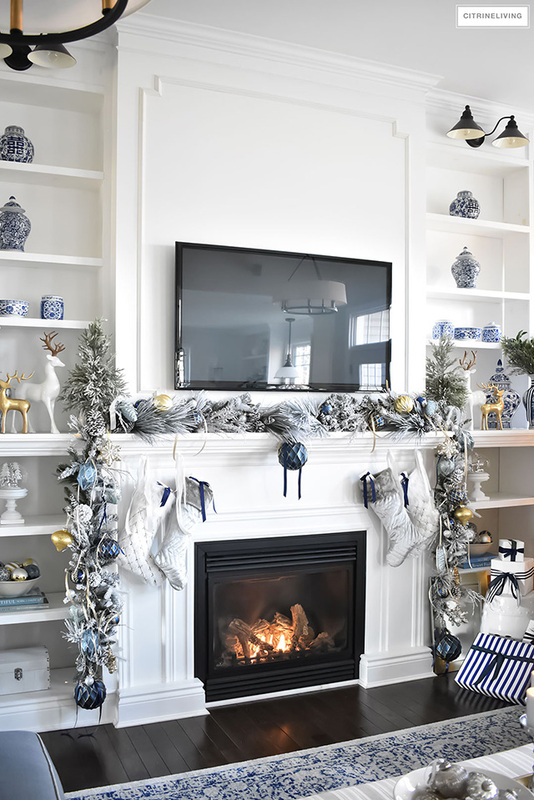 This year I invested in new garland or our mantel. 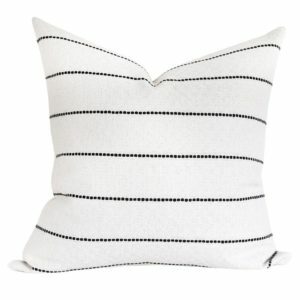 I wanted something a little fuller and I found this gorgeous one from HomeSense – a very lucky find! 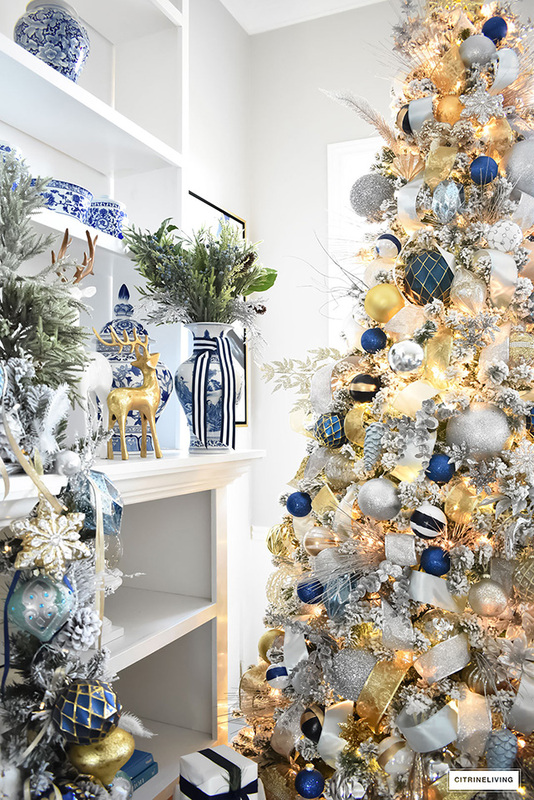 It’s actually two garlands, and the secret to making this look so full and lush, is added flocked greenery along the top, and ornaments tied with ribbons all around. 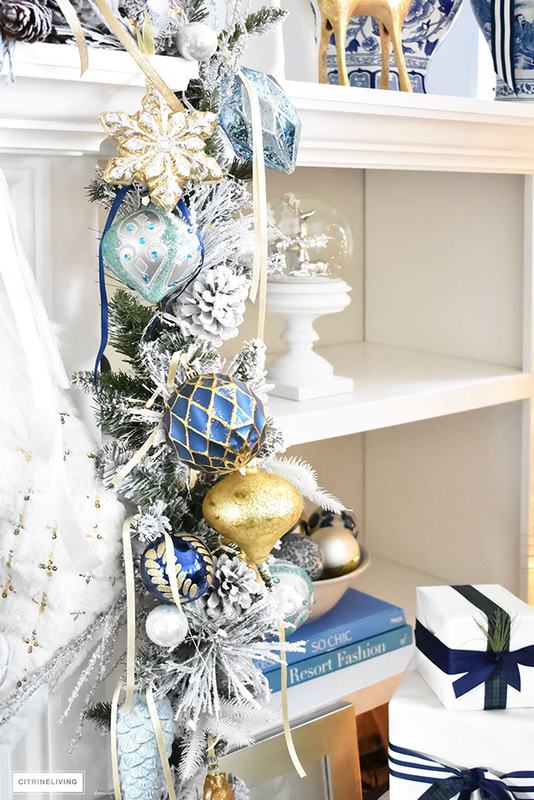 It’s very simple to do – thread your ornament with a ribbon and tie it to a branch, close to the base if you can, so it’s somewhat hidden. 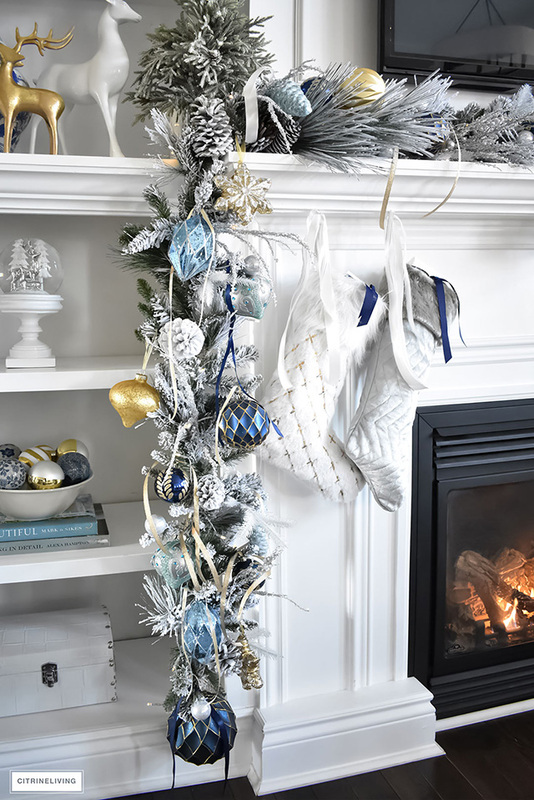 Let the ribbons hang down to add more depth to the garland, and it’s really pretty! 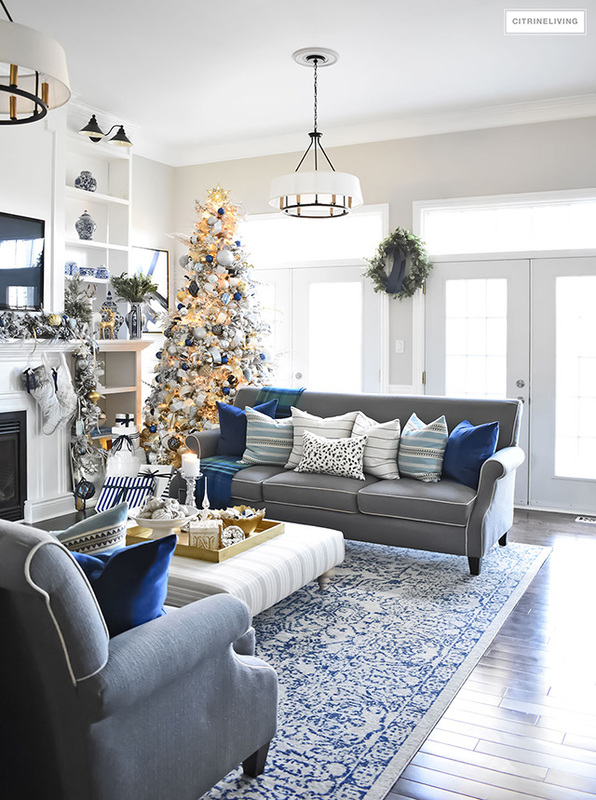 I also hung large-scale navy ornaments at the ends of the garland and the center, the same ones I used on the back of our dining room chairs. 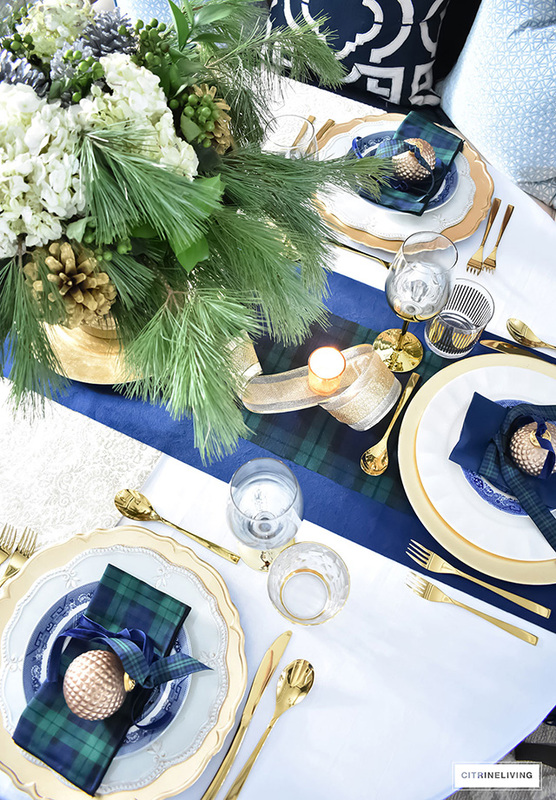 If you missed my Classic Christmas tablescape and peeks of my dining room, you can see it all here. I’ve also linked to that post, and the rest of my Christmas posts down at the bottom of this page. 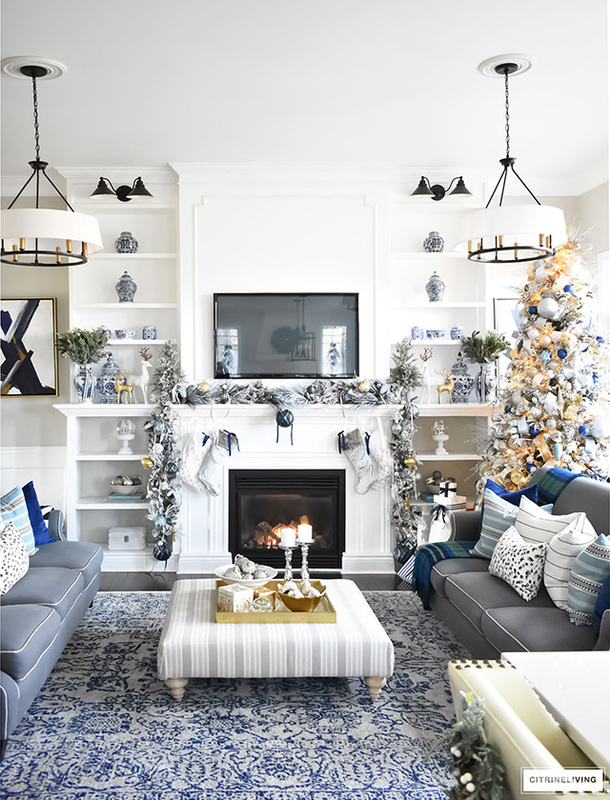 I’m all about symmetry, so I created balance by hanging the same ornaments on each side of the garland as well. 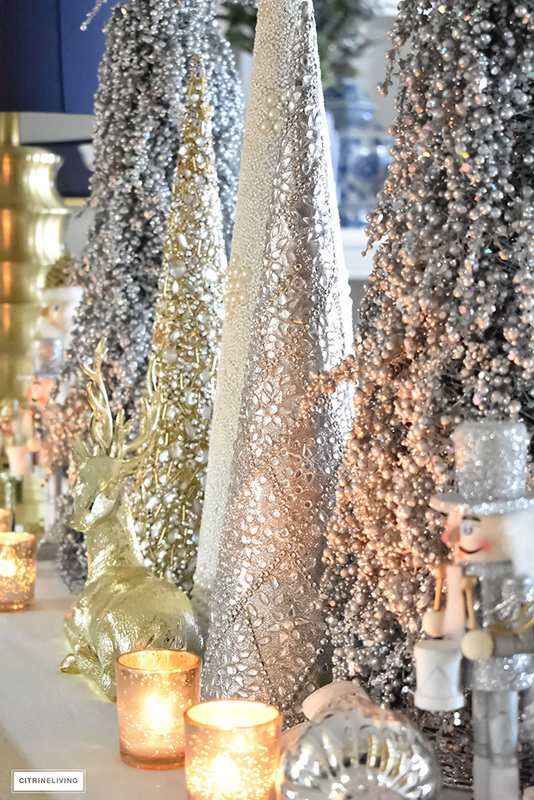 On our buffet behind our sofa, I used an arrangement of beaded Christmas trees, in varying heights in a mix of white, silver and gold. 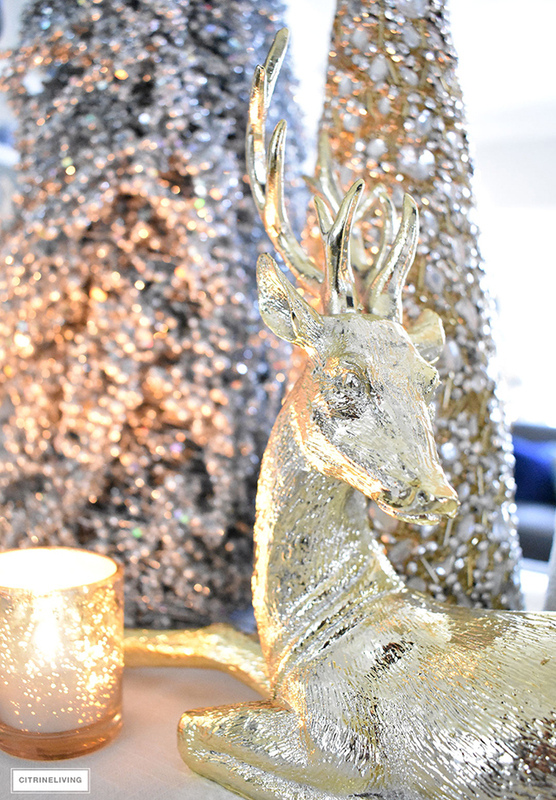 I added my small collection of nutcrackers paired with some votives and a majestic gold reindeer to compete the scene. 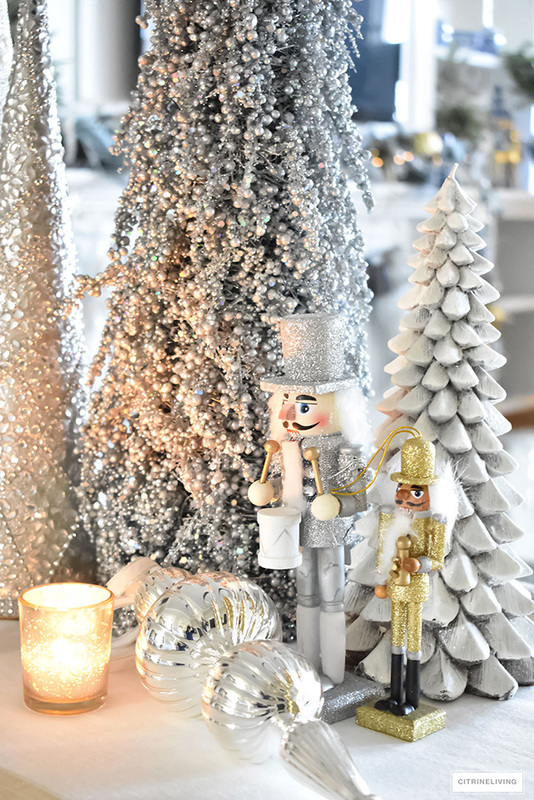 I’m loving the mix of textures and all of the shimmering metallics. 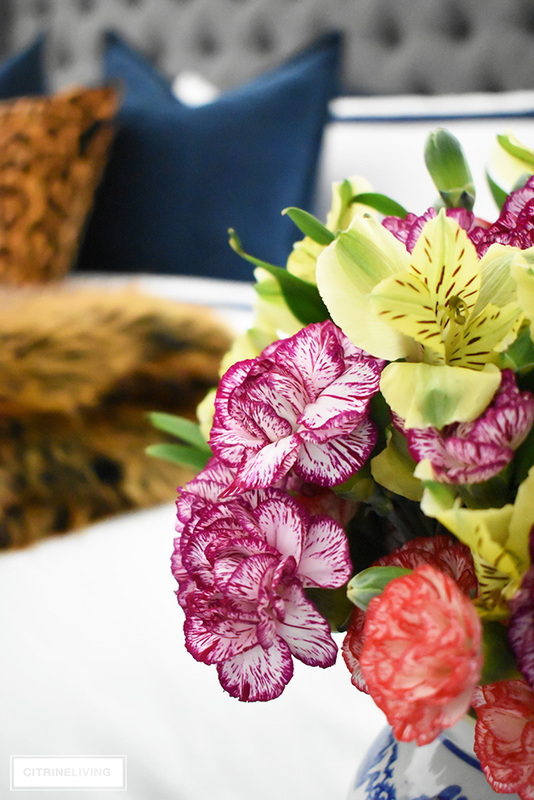 It’s an elegant statement and this would be beautiful on a foyer console table too. 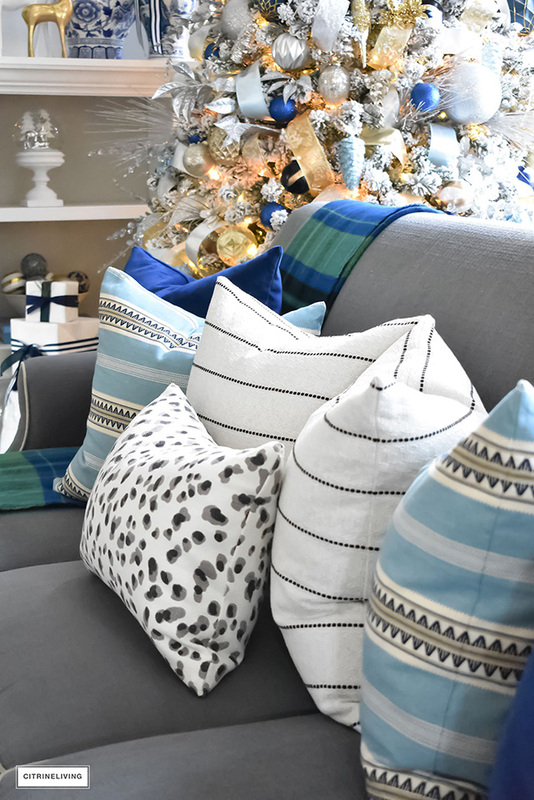 If you’ve read my previous Holiday posts, then you know about my new pillows from Tonic Living that I combined on our sofas. 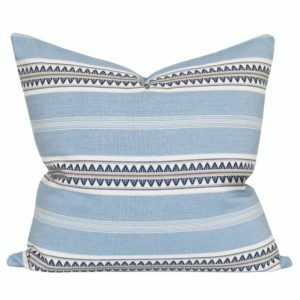 I always love to mix pattern, as many of you already know. 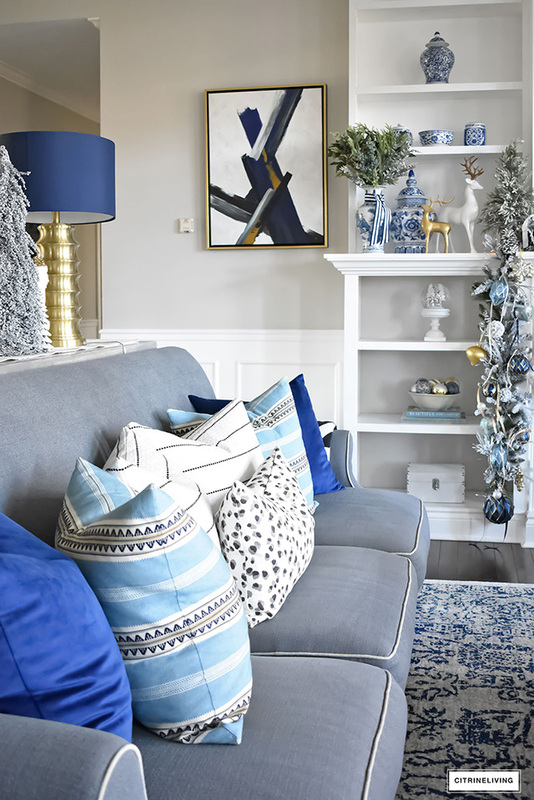 It’s all about blue and white, texture and pattern with this mix. I’ve linked them all at the bottom of this post again for you. 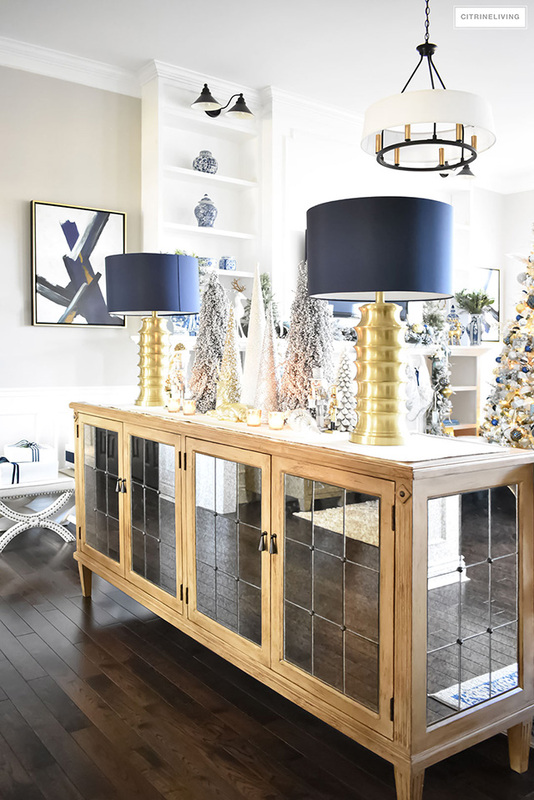 This is a cool-toned color palette and the touches of gold and brass throughout our home along with the addition of gold Christmas decor helps to keep it warm. 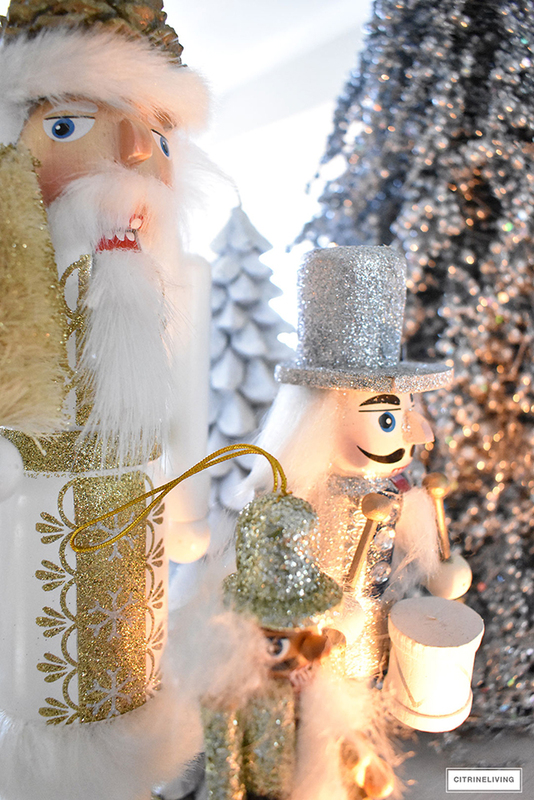 Our tree has many gold ornaments as well as ribbons to keep it from being too ‘icy’ looking. Although someone told me our tree looked cold, and I thought that was pretty interesting! 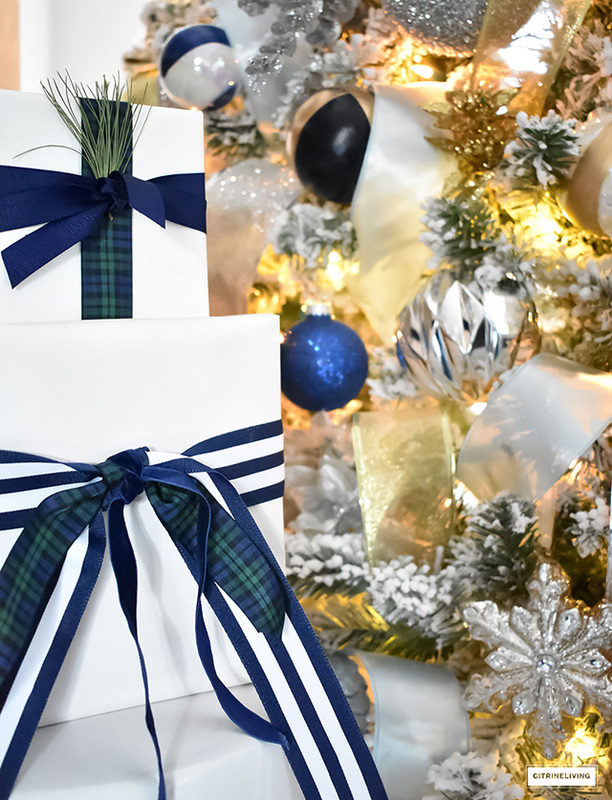 You’ll see this beautiful navy and white striped ribbon throughout our decor this Christmas too. 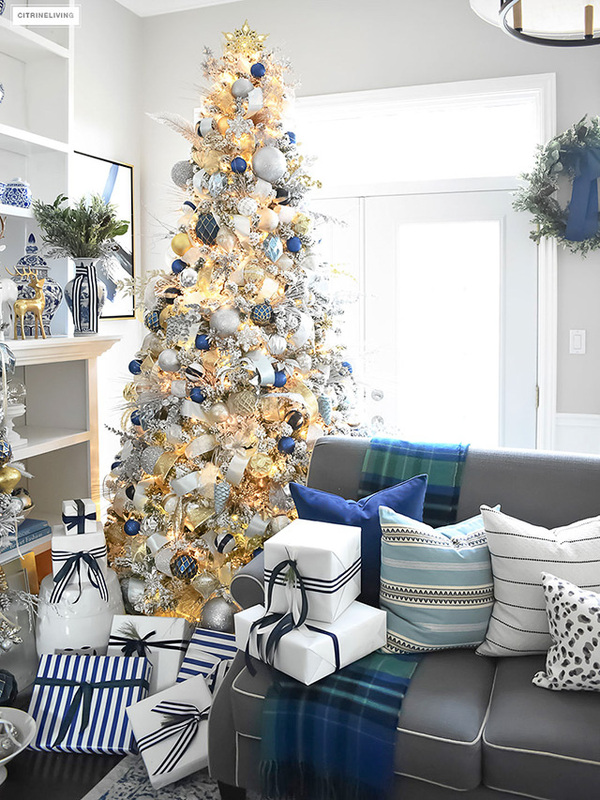 Who would have thought something so preppy and nautical could look so festive and chic?! 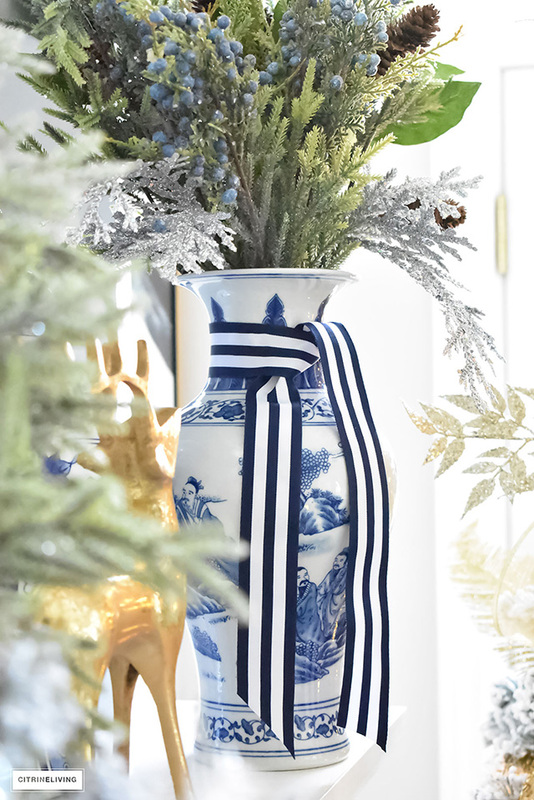 They’re perfect tied on my blue and white vases. And they coordinate with some of my tree ornaments and gift wrap too. If you haven’t seen our tree close up, you can see it in more detail here. 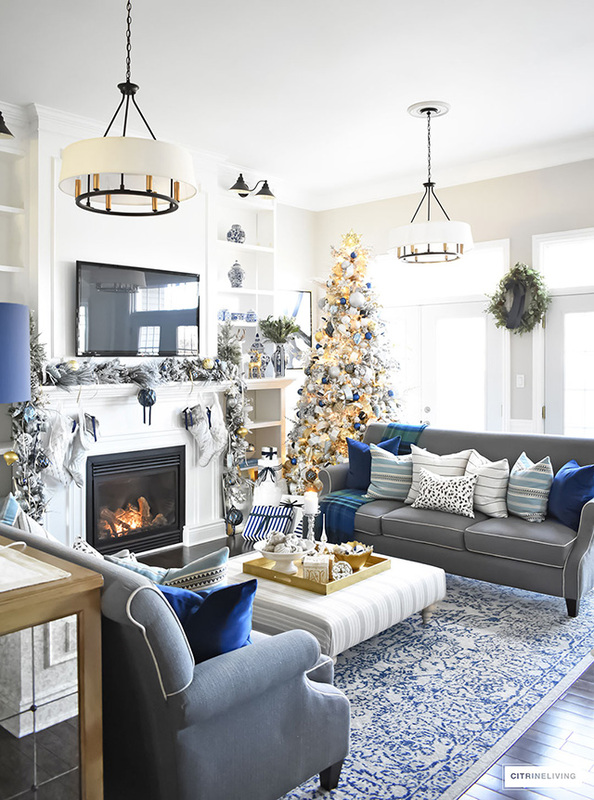 It feels like a winter wonderland in our living room, but what I love most is that it’s still cozy and warm. 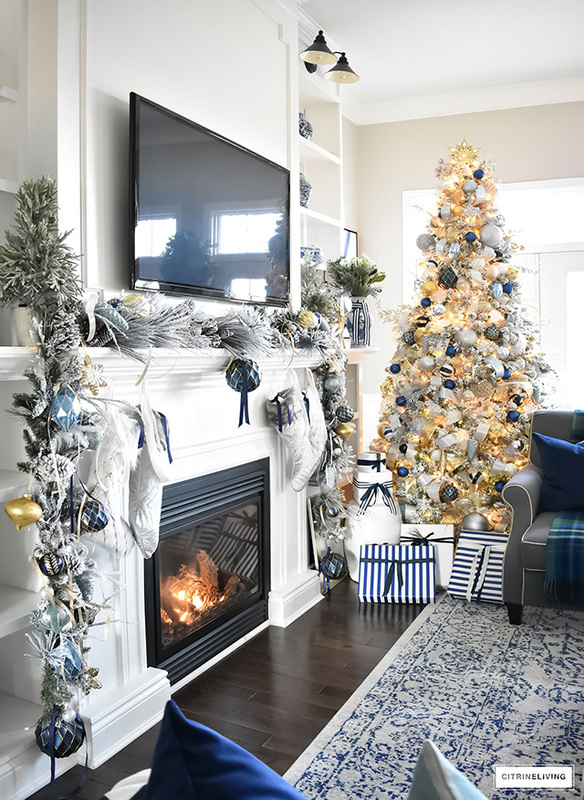 Our kids are getting older now, and what makes me happier than anything, is hearing them both tell me (my 14 year old son included) how much they love our Christmas decor. They love to hang out in here with us – this is where we hang each night and watch movies together. This room gets used daily and to it’s maximum, trust me! 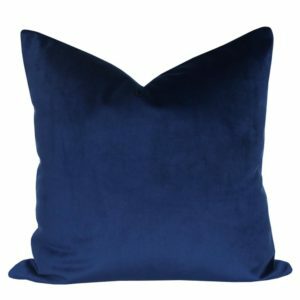 Pillows are everywhere, blankets too. Snack bowls and drinks, magazines and books. I just pick up every night before bed. 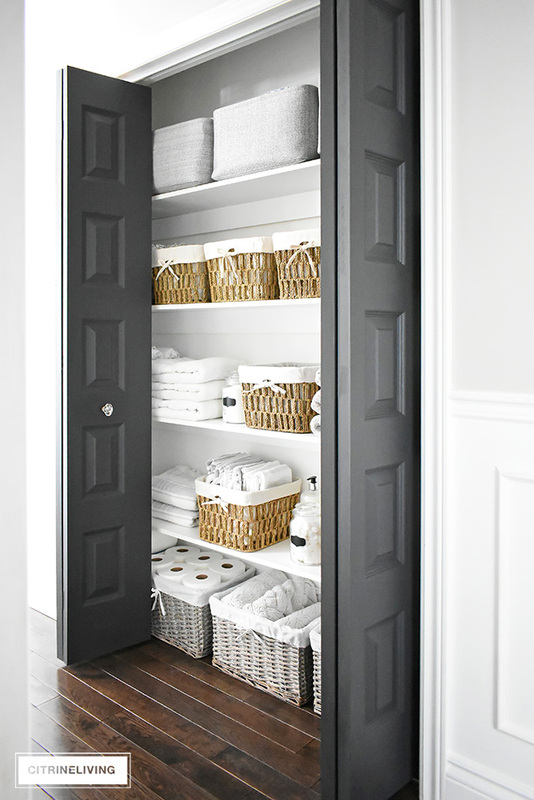 There’s nothing like waking up to a clean space each day. 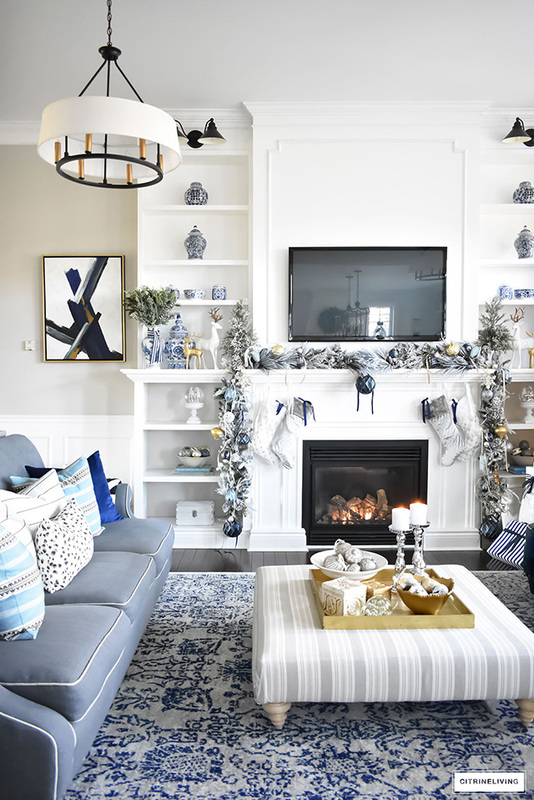 Waking up to this on Christmas morning this year will be something special because I know how much my family appreciates all the work I’ve put into creating a Holiday home that’s not only beautiful, but warm and comfortable and cozy too. 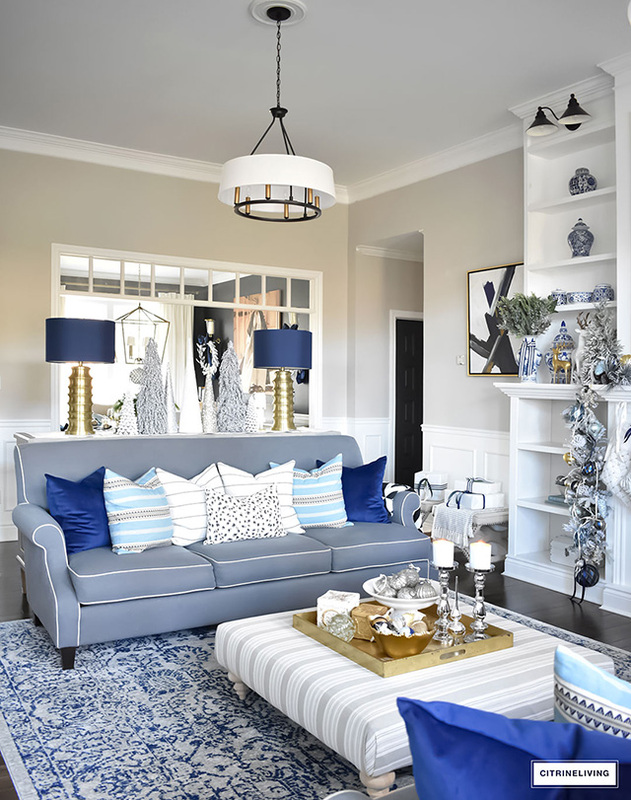 Anyone can do this – you can have a beautifully decorated home and actually live in it! Looks amazing! love just hanging out listening to some classic Christmas tunes. 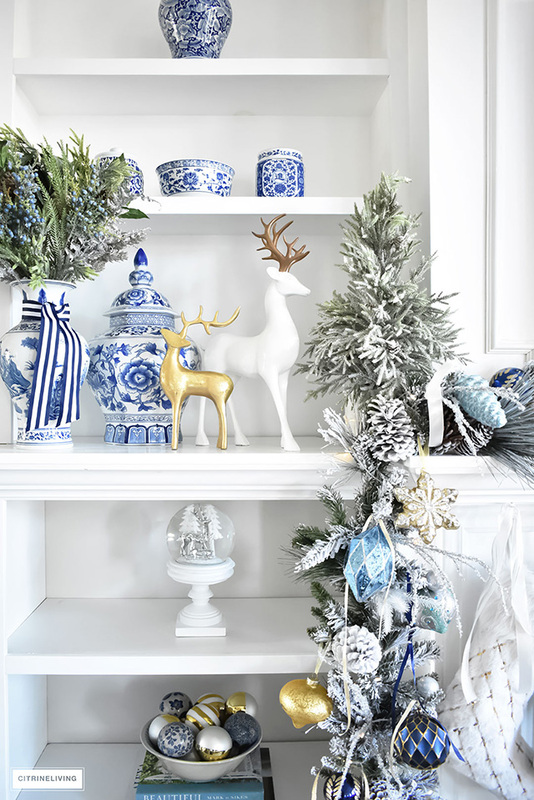 I am a blue and white freak,so it goes without saying I love everything you have done. 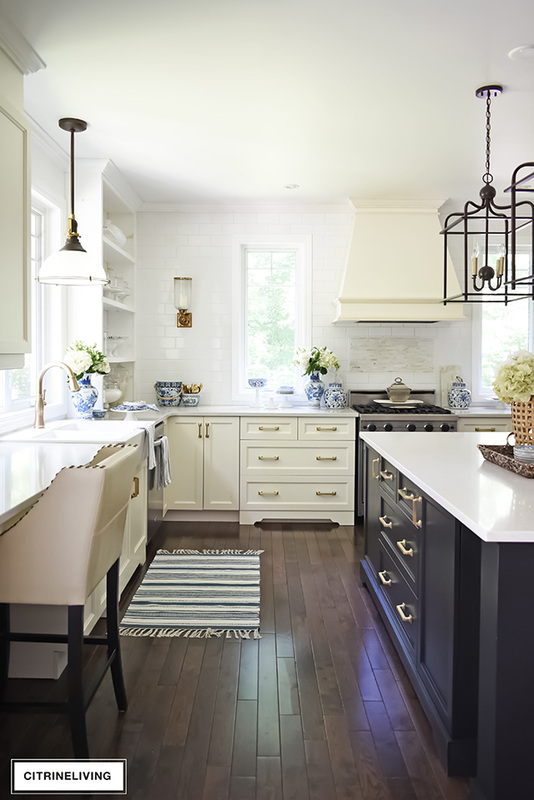 This is such a stunning space! 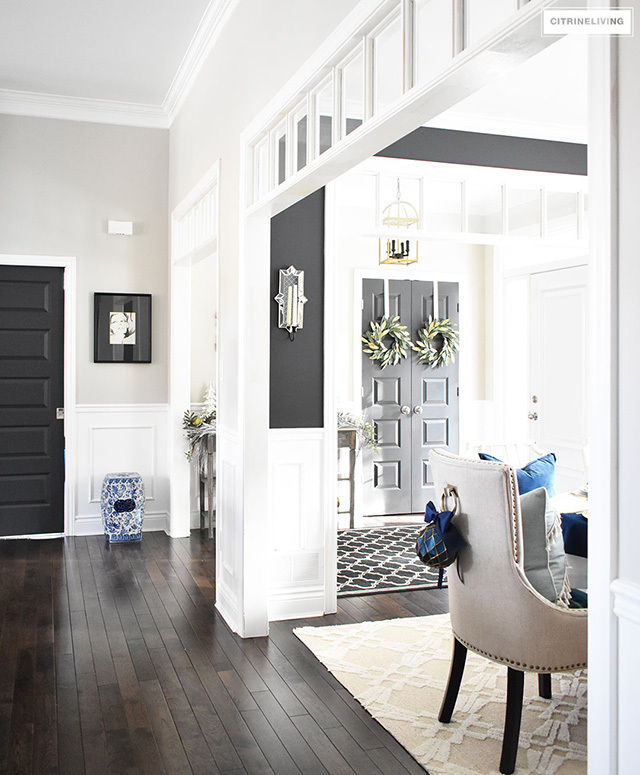 So classic and chic! Krista, thank you so much! That really puts a huge smile on my face! So happy you stopped by! Merry Christmas! Gorgeous, Tamara. I’ll keep coming back to your living room for inspiration. Absolutely stunning. Where did you get your rug? 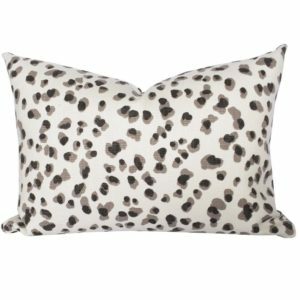 Is it the one you have listed at luluandgeorge? It’s so inexpensive! Is it the same one?? Hi! Yes, it’s the same one! And we love it!! Tamaraanka, I just now came upon your beautiful and so tastefully designed home. 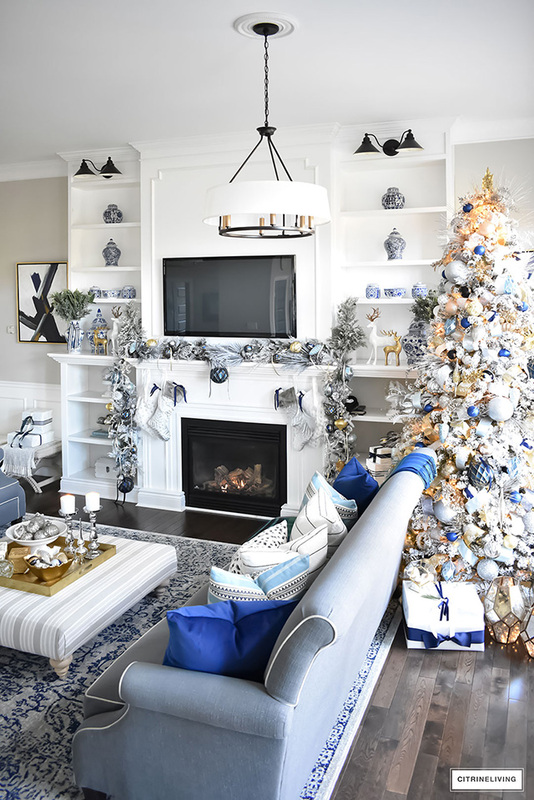 I believe that it is truthfully the most exquisite use of blue and white I have ever seen. Well done Tamaraanka. 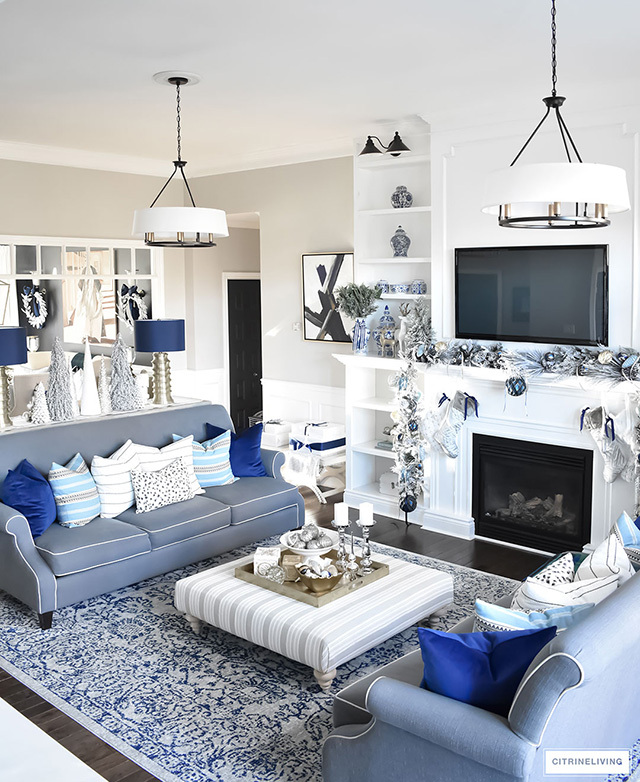 About three months ago I myself had decided to choose blues, creams and grays for the home my husband and I are remodeling. This will be the last home we hope to ever live in and I’ve always wanted to work with these colors. So my question to you is about the beautiful color on the wall. Would you happen to know the name? 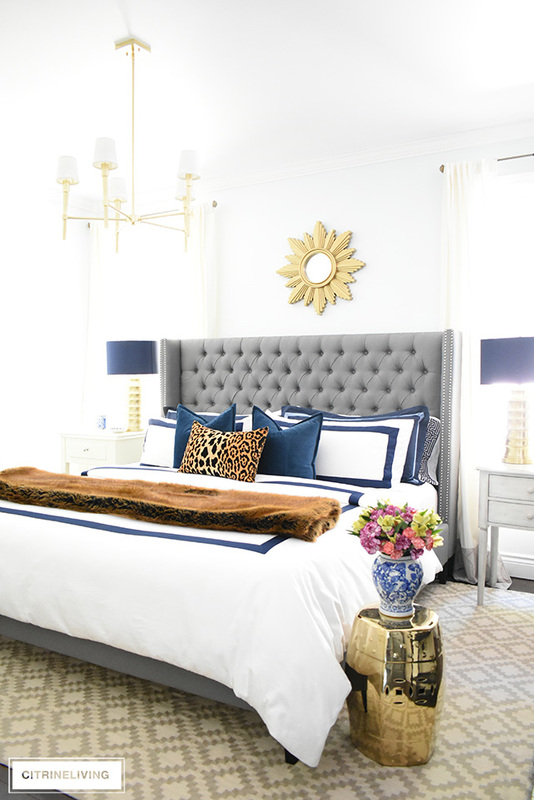 Picking the wall color has honestly been the most difficult part of this design for me and I would be so grateful. 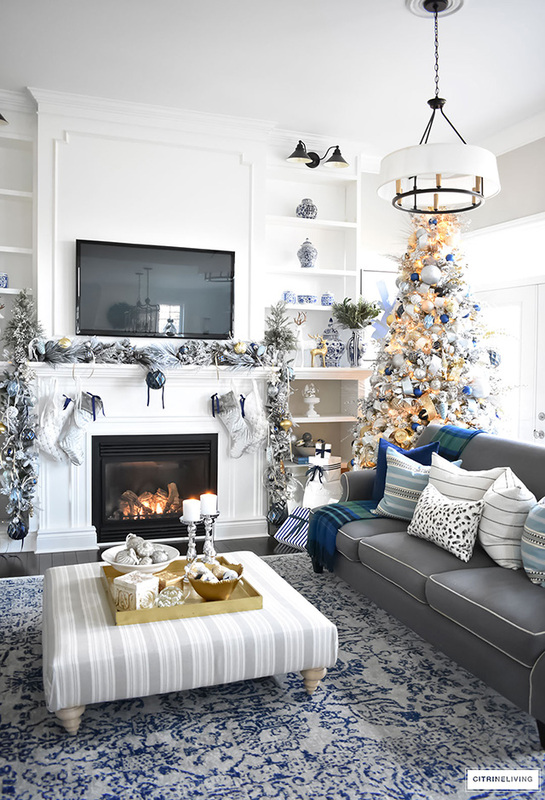 Again, such beautiful rooms and I cannot wait until Christmas to use your design ideas.